A little over a month ago, Marvel graced the theaters with yet another action-packed, superhero origin story. But this time, they went in a different direction. They didn't shoot for the stars (or galaxy), they didn't try for a big battle of aliens, killer robots, or superheroes. They focused on something a little... smaller, more... ant-sized. Yes, Ant-Man is unusual for a solo film, especially when thrown amidst movies like Avengers: Age of Ultron and the Ironman trilogy. But he made the team. Here at The Fangirl Initiative we know heroes come in all shapes and sizes. 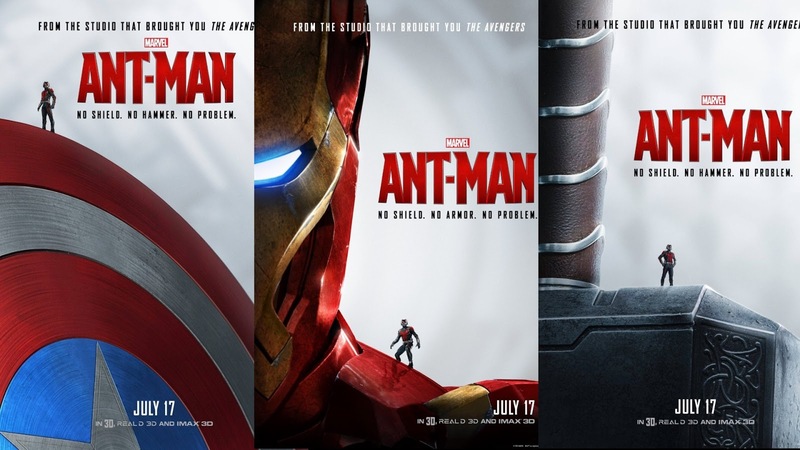 So we gave Ant-Man a chance, we trusted Marvel for something new (and hopefully better than Ironman 2, which nobody discusses). We got something new, something different, something...ant-sized compared to the blockbusters. And this is what we thought of Ant-Man. I knew Marvel couldn’t be dusting off this old hero (who they skipped to join the Avengers line-up despite being an original member) just to crash and burn (or get squashed). Especially when they decided to release it the same year and summer as Avengers: Age of Ultron. I knew they had some kind of plan, some kind of opportunity to make a little, insignificant hero into something more than the comics. This movie exceeded all my expectations. I feared failure. I didn’t believe it would be successful, but I trusted Marvel; and they’ve kept my trust. In the same way they took a giant leap with Guardians of the Galaxy (which failed miserably in the comics), they took a leap with Ant-Man. I’m astounded by what I watched. The movie was heavily science-y and heist-y, but I could understand it (or at least enough to match Scott’s ability to understand it). It was fun, funny, action-packed, and just plain awesome. Who knew a guy with the abilities to shrink and communicate with ants would be cool? Not me. But that’s the thing with Ant-Man. He’s different than the other heroes: thus, he can be approached in a different manner, which is exactly what Marvel did. Somewhere, Stan Lee is sitting in a room crying over this film and how it did everything the comics never did. He created Ant-Man for the idea of a hero with the ability to shrink so the visual layout of the comics could be unique; he wanted Ant-Man to look “normal” sized while everything else was drawn giant-sized. But it just didn’t happen. Ant-Man was drawn tiny while everything was normal sized. 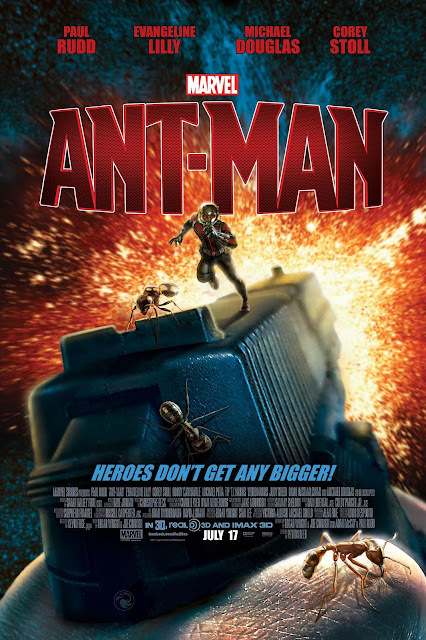 But this film did it: it showed things giant-sized while Ant-Man looked normal. I loved Evangeline Lilly and her character. She’s the Red Queen, but she’s not necessarily a villain (for now? ), she’s just a scarred person. I loved the manipulation of the original Scott Lang origin stories mixed with Hank’s story arcs. I loved the comic references (which I’m no expert of since I’ve never read a comic just encyclopedias and databases but it still made sense how they created this film and the plot). I loved the fun of Scott learning, while the balance of this is a serious risk they need to stop. I loved the in-world interactions: the casual mention of Hydra (I called it), the references to the Avengers, even the appearance of Sam freaking Wilson (which is just marvelous how they tied this movie right into Civil War). I loved that Scott was a criminal finding redemption—not a perfect man, but someone who was chosen to become a hero because he could break in and steal things. I loved his relationship with his daughter (and ex-wife and her fiancé). I loved that he did this for Cassie and that Hank did this for Hope. This movie—along with Guardians of the Galaxy—revealed heroes do come in all shapes and sizes and from all types of backgrounds and origins. A person doesn’t have to be perfect to be a hero. A person doesn’t have to be strong, enhanced with powers, or rich to be a hero. They just have to be willing to do something. There’s so much to Ant-Man yet to explore (for one, that beautiful Red Queen suit for Hope at the end and whether Cassie will become a hero in the future as well). I was skeptical, I was excited, I was worried. But Marvel, you did it again, maybe even better this time considering you convinced me to care about a hero the size of an insect. I’m stoked for Scott Lang to join the Avengers. And I’m never going to step on an ant ever again. I’ll be honest: I was one of the doubters. I didn’t think Ant-Man was going to be a good movie. But I was completely wrong. I enjoyed Ant-Man even more than I enjoyed Avengers: Age of Ultron. If you’d asked me a month ago if I thought that would happen, I would say no. But Ant-Man was on point in so many different areas. Major props to those who were in charge of the visual effects department. Their hard work paid off. Between all the tiny-Scott scenes and the amount of ants that needed to be animated, to the stunning animation of the quantum realm, the visual effects were fantastic. I loved that we got to see Scott take on the dangers of a bathtub, a record, and even a giant mouse. Everything was perfectly animated and believable, and I felt like I was living the movie. Even the credits scenes were aesthetically beautiful. Amazing. From the beginning I was rooting for all of them. Except for the two villains. Darren Cross (Yellowjacket) as a villain was awesome and, while he was a bit one-dimensional, I think the angle of being Hank’s prodigy gave him a lot of depth. I especially love that Hank pushed him out because “he saw too much of himself” -- that was such a perfect line. The secondary, unexpected villain was awesome and the problems our heroes had to face were well done, too. The film of Ant-Man managed to be totally childlike with a very mature adult feel, and I don’t know how they pulled that off. I was laughing out loud several times during the movie (especially the train scene. You know what I’m talking about). Yet the comedic moments never took away from the gravity of the situation. The film kept my attention from the start and everything it did was fresh. I completely enjoyed seeing life from an ant’s perspective, which is something I hadn’t expected to say. There may not be any Avengers in this movie (except my darling Sam Wilson, whose cameo made me ridiculously happy), but please go see it anyway. Ant-Man’s stature may be small, but the movie makes up for it with stunning visuals, catchy one-liners, and a whole lot of heart. Before we went, though, reviews started rolling in. People were saying Ant-Man was good. Great, even. How on earth was that possible? Still skeptical, I bought my ticket and settled in to form my own opinion. Here’s what I came out of the theater with. My favorite scenes were undoubtedly the opening (here’s to you, Agent Carter!) and the credits scene. Not the one with Hank Pym and his daughter. The one after that. So what about everything in between? It wasn’t as bad as I had braced myself for. But it also wasn’t as great as I had begun to cautiously hope. It fell somewhere around average for me, or slightly below. I think Paul Rudd did a good job bringing life to the role of Scott Lang / Ant-Man. Scott is a generally likable guy, with some useful skills and a pretty laid-back personality. The rest of the characters and cast were a mix for me. Hank Pym takes up the required scientist slot here, and his daughter, Hope, is around as the strong female presence… Who inevitably falls for Scott, even though I felt the two had little chemistry or romantic build-up. Scott’s gang of wannabe gangsters spent most of the film trying to be comic relief and instead annoyed me. The villain felt one-dimensional to me, and a good deal of the plot seemed implausible, even for a superhero flick involving insects. With all that said, you should still watch Ant-Man. I know, I’ve hardly made a convincing case. But since he’s going to be an Avenger, and there are several references to the Avengers in this film, it’s worth a look. I’m interested to see how Scott’s character develops as he moves towards a role in the Avengers. 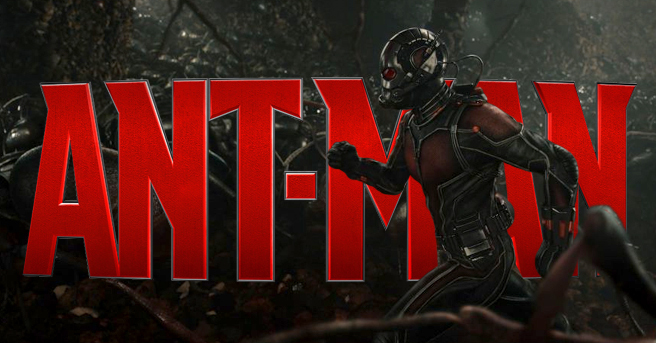 Ant-Man won’t make you think too hard, and it’s nowhere near the intensity of Marvel’s more recent films. But it manages to be a fun way to spend two hours, and if nothing else, you have got to see that end credit scene. It earns somewhere around 2.5 stars from me. Not bad, since I had ant-sized expectations to begin with. Okay, let me say right off the bat that I loved this movie. It might actually be my favorite in the MCU (which is a really high honor). Let’s start off with what I liked, shall we? Scott Lang himself. I guess I’m not sure how anyone wouldn’t like him. He’s a doll. Luis and his buddies. They just made the movie. Without them, I don’t know if I would have liked it nearly as much. Scott’s relationship with his daughter. 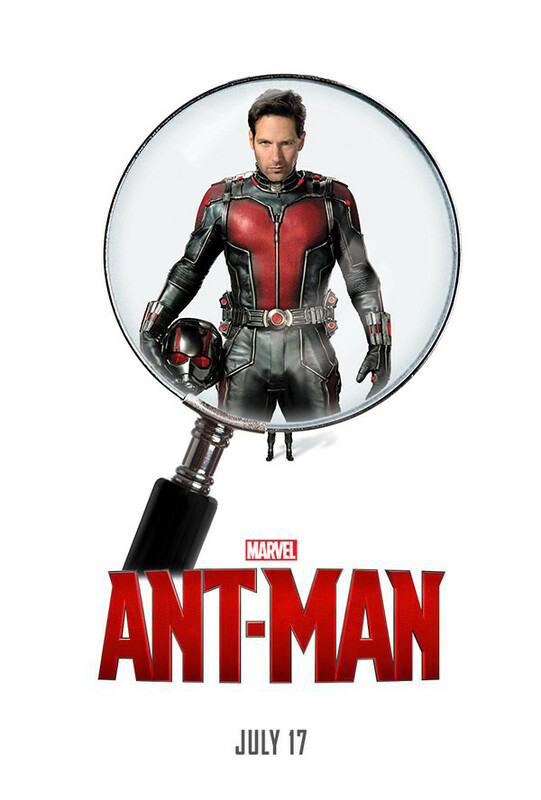 Personally, I decided to go into this movie pretty blind (I did know the original Ant-Man origin story with Hank Pym, but I knew nothing about Scott Lang. ), so I was not expecting this to be so powerful. One of my favorite things about this was that sweet Cassie actually looked up to her Daddy. A lot of times in movies and books, parents can be portrayed in a more negative light, so I really appreciated this. The pacing. This was absolutely spot-on. There were no spots that felt like it lagged at all and I’m so glad of that. It’s a bit shorter than some other MCU films (under two hours, I believe), but it totally worked. If it was any longer it probably would have been too long. It’s so…down-to-earth. Yep, that’s a pun. He’s small, so he’s literally close to the earth. Ha. But really, it felt very real and maybe…less super than the other movies. Scott’s really just a normal guy. However, there was one big thing that I wasn’t too crazy about. As much as I loved, loved this movie, I thought that the villain’s character development was a little bit weak. While I understand why he did what he did (he did have a reason), he felt a bit flat to me. Maybe it was the acting or how the character was written, but this was the one part of the film that wasn’t my favorite. I didn’t hate it, but I am a bit disappointed. Like I said before, I really, really enjoyed this one and it’s definitely a new favorite. I can’t wait to watch it again! Ant-Man has done—for me—what the previous standalone Marvel film immediately following an Avengers installment (Iron Man 3) could not do: tie—arguably even surpass—its predecessor. What does it say about this film that for once both critics and moviegoers were united in their praise and admiration? Every time, each Marvel film exceeds my expectations. - Paul Rudd. I loved Paul in Friends as Phoebe’s down-to-earth but hilarious husband Mike Hannigan, and Paul ups the ante even further with Scott Lang. When the boys are preparing for their caper, all gathered round the table—each doing his own thang—Scott’s bent over some delicate piece of wiring with magnifiers and a soldering tool, and I leaned over and whispered to my brother: “He’s the new Tony Stark.” Paul’s Scott has got the humour to match that of the legendary Shell-Head, as I have no doubt that’s what Marvel intended by inserting him into the recently-vacated Iron Man movie spot. And even though he did not build the suit, he takes to it like he was born to it. - Michael Douglas as Hank Pym and Evangeline Lilly as Hope Van Dyne. When Douglas marched into the Triskelion to bloody Mitchell Carson’s nose and reclaim his Particle from Howard Stark, “Michael Douglas” melted away. He was Hank Pym…and more: Douglas brings a warmth and mellowed wry wit to the character that Comic-Hank often lacks. Before the movie premiered, I was a little worried that Hope would be all business and none of the humour possessed of her famous mother, Janet Van Dyne. But my fears were groundless, for Lilly’s Hope is spunky, savvy, battle-ready, and the humour is there…just needs the chance to grow. - Moments of heart. In the comics, Scott became Ant-Man because he needed money to get a gravely-ill Cassie medical treatment. I loved the new twist that has Scott desperate for a job so that he can see Cassie. It hits much closer to home, and I’m pretty sure all of us felt for Scott deeply. I’ve grown to know and love Jan Van Dyne; her heart, her bubbly nature, and the pride she took in being a founding Avenger. So when Hank began his tale, I knew something terrible was coming. The tears started long before the Russian warhead appeared, and by the time Hank finished I was sobbing. And that wasn’t all: when it was Scott’s turn, his simple “I love you, Cassie” brought the waterworks back, full-blast. - Supporting cast. Who among us was not thrilled by the appearance of Anthony Mackie as Sam Wilson (Falcon)? (And secretly glad for Scott’s sake that he was the only Avenger home?) Michael Peña, David Dastmalchian and T.I. were great as Luis, Kurt and Dave, providing many of the funny moments interspersed throughout the movie. And what about Scott’s supporting ants? I for one found myself developing affection for those six-legged arthropods, and since that first Ant-Man viewing I have been treating insects with more deference—depositing spiders and ants outside when I find them in the house, instead of squashing them. Heck, I give Corey Stoll’s turn as Darren Cross/Yellowjacket a higher rating than all but Robert Redford as Alexander Pierce, Jeff Bridges as Obadiah Stane, Tom Hiddleston as Loki (of course), Lee Pace as Ronan, and James Spader as Ultron. - Oh, and the end credits scenes. Hope’s future Wasp suit got all us fanboys’ and fangirls’ hearts racing, and it didn’t help our blood pressure when actual footage masquerading as the very end-end credits scene snuck onto the screen. Bottom line: Ant-Man stands a shining example of Marvel’s creativity, ingenuity, and devotion to its characters and stories. We’ve got political thrillers (Captain America: The Winter Soldier), space operas (Guardians of the Galaxy), swords hammers-and-sorcery epics (Thor, Thor: The Dark World), box-office action hits (Iron Man, The Avengers, Avengers: Age of Ultron, just to name a few), and now we’ve got a heist movie, with a hero worthy of the Avengers’ ranks…Ant-Man. Did you give Ant-Man a chance? What did you think of this new hero and his story?